Relax and enjoy one of the most luxurious condos in the Mana Kai Condominium Resort. Condo #503 is located at the end of building closest to ocean. Located on the fifth floor, this two-bedroom, two-bath deluxe oceanfront superior suite has been recently completely renovated and redecorated. Brand new island inspired furnishings have been used throughout the condo. You are certain to enjoy the breathtaking view and the fragrant breezes as you relax and watch the magnificent sunsets from the condo’s beautiful lanai. 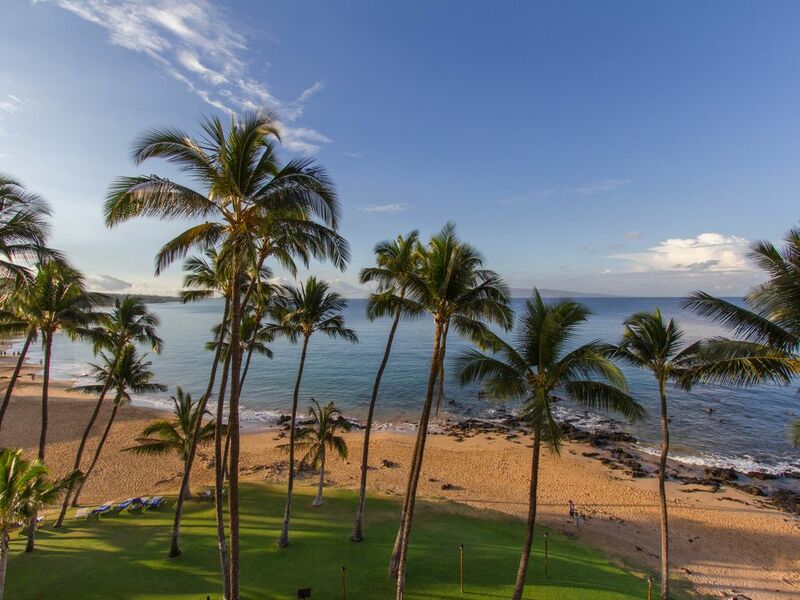 You will also have a perfect view of the beautiful Kewwakapu Beach and the Haleakala volcano. Swim and snorkel the reefs in crystal clear water just 150 feet from your condo. Let the soft sound of the ocean waves lull you to sleep in your king-size bed. Awaken to the soft breezes whispering through the palms to a day filled with fun and beauty and relax knowing your beautiful, luxury condo awaits your return. Recent renovations and upgrades to this luxury condo have made it a superior suite. One of the few condos in this resort with central A/C throughout. It has been furnished throughout with top-of-the-line tropical furniture. The lighting fixtures have all been upgraded and recessed lighting has been added throughout for a softer touch. The main living area and master bedroom area can be separated or opened up to enhance the ocean view with a custom design Shoji doors made of frosted panels that can easily slide away. Our condo features two custom baths; one with a soaking tub, the other with a walk-in rain shower. The fully-equipped kitchen with granite counter tops features a stove with microwave drawer and convection oven, Sub-Zero refrigerator and freezer with ice maker, blender, toaster, refrigerator, coffee-maker, and is stocked with cooking and eating utensils. There is a comfortable dining area or you may want to dine while enjoying the breathtaking view from your lanai. There are three restaurants located within walking distance from your condo. The Five Palms Restaurant, a romantic, open-air restaurant with fine food and attentive staff is located just down stairs. Breakfast, lunch and dinner are served. You will also enjoy the stunning panoramic view of the world-famous Wailea coastline while you dine. At the entrance to the Mana Kai Resort is Zacks, a convenient high-end deli and general store featuring an exquisite collection of over 450 wines, a wide selection of liquor, a complete line of beverages, deli meats & gourmet cheeses and also an assortment of delicious desserts. Sarento’s, a fantastic five-star Italian restaurant, is just a short stroll down the white, sandy beach. The Mana Kai Resort is located at the extreme south end of Kihei, which is a few hundred yards down the beach from Wailea, known for its five-star luxury resort hotels. As a visitor to the Mana Kai Resort, you have access to a beautiful oceanfront heated swimming pool surrounded by palm trees and tropical foliage. Other Mana Kai facilities include a restaurant, gift shop, beauty shop and general store. Washers & dryers are available on each floor for visitors enjoying an extended stay. Meeting and conference facilities are available on-site for the business visitors’ convenience. Should you desire to plan excursions such as a whale watching tour, a luau, a helicopter tour, cruises, or many other Hawaii adventures; an activity desk is located in the Mana Kai lobby to help assist with your reservations. World-class golf courses of Wailea, Makena & Silverwood and exquisite shopping are only minutes away. The Mana Kai condominium exterior was also recently extensively remodeled. BOOK NOW – This amazing condo has just released for booking!! Thanks again for your interest in our condo # 503 it truly is the best of the best. Our two-bedroom deluxe ocean view superior suite, recently totally renovated (November) with Island furniture is our home away from home. The difference starts with our location, and by far one of the best. Located by the end of the building closest to the ocean and away from the NOISE of the pool, elevators and foot traffic. The front door is equipped with a coded push button lock, which offers the freedom of not having keys. The Lanai floored with 16 x 16 ceramic tiles and furnished with weaved polythurane-coated table,chairs and footstools. Sleep while listening to the ocean sound of the waves rolling. One bathroom offers a walk in rain shower with glass wall, which is unique to our facility but gives you the view of the entire coast of Maui. The second plush bathroom offers a full soaking tub and not just a standard tub. All bedrooms have 600 count linens on all beds with queen size feather pillows finished with black out curtains. Prepare all your home-cooked meals in our fully equipped Gourmet kitchen. This kitchen offers sub zero frig. (ice maker included) most do not, confection oven, micro wave, glass top stove, bamboo cabinets, granite counter tops, glass block splash back and finished with low voltage lighting. In times of bad weather or just taking a break from the strong trade winds enjoy the central a/c through out the entire condo and not just one window unit located in one bedroom. Additionally we have moved more walls creating more usable space. Thanks again for your interest in our condo and I hope you take the opportunity to visit with us. The Best In South Maui !! The Best in South Maui!! Central A/C Throughout!! A must have!! Great stay and amazing view! Great stay and beautiful view! Very nice condo and well stocked kitchen. We really liked the community feel too that the condos had. The outside lawn space and grills were great. And you can’t beat the location! This is my fourth visit to the Mana Kai and this unit was by far the nicest I have stayed in. It was very close to the water so you could hear the crashing waves at night, the kitchen was beautifully finished with marble and stainless steel, the bathrooms were also very high end and the whole place was clean and had everything we needed (many towels, beach chairs, a little packet of toiletries, hair dryers). Gary was very easy to deal with, responded quickly when we had to change our booking, and helped the whole process move along seamlessly. A much better alternative to the expensive Wailea hotels. Thanks so much for taking the time to inform other guest who might want to hear from other past guest. Remenber we give a loyalty discount for all returned customers that are in good standings. Amazing Modernized Ocean Front Maui Condo! Thank you to the incredible owners for being willing to rent their phenomenal modernized ocean front condo. First of all - the location is absolutely amazing. From the stunning beach views and sunsets to Humpback Whale watching and Hawaiian Green Sea Turtles, nature surrounded us. You can walk seemingly forever south on the beach or north on the sidewalk and continue following the public access signs. The condo building has beautiful manicured tropical grounds with the open air lobby that we love. From the pool and plenty of oceanside beach lounge chairs to a well equipped new exercise room downstairs and washers/dryers on the floors, Mana Kai has all of the amenities. You can book so many excellent restaurants at any of the high end Wailea hotels within a 5 minute or so drive such as Morimoto’s at the Andaz Hotel, Te Au Moana Luau at Marriott Resort held right on their beautiful beach setting, or book more casual such as the Monkeypod Kitchen. There is also the quick convenience of their own 5 Palms restaurant right downstairs or take a 2 minute stroll to Sarento’s Restaurant for breakfast/brunch or dinner which we absolutely enjoyed. Both restaurants have direct spectacular ocean views. During our stay we had an unusual 2 day storm coming south from the Aleutian Islands which affected all of the Hawaiian islands. In the past at another condo which was a mile from the beach in Wailea, we heard the roar of the wind all night and could not sleep. This condo had none of that storm wind noise being so well built and let us feel very secure. A previous reviewer mentioned the hard bed. I have an issue where hard beds do not allow me to sleep well but this master suite bed was good letting us get a solid night of sleep. Our friends slept in the back second bedroom which appeared to be a much harder mattress but they absolutely loved their bed firmness. Parking spaces are tight and assigned. If someone on either side parks too close to the line as what happened to us, you cannot easily get out your door. We did not have an oversized car. Finally Gary is incredible. We had a glitch in the door code and he worked getting that fixed immediately. Gary and his wife were excellent with the speed of their response and you can tell they really care about their guests. We have already booked the condo for next year in 2020. BTW—we never write reviews with our busy life. This time we had to share our fabulous experience. Mahalo. Guys thank you for taking the time out in writing such a GREAT review. Remember we offer a loyalty discount to all returning customers who remain in good standings. Great location; excellent unit; highly responsive owner. Our third time here; we'll be back. Thanks Gary. Again, we enjoyed our stay. Thank you for taking the time out in writing a review for others to see. Please remember we offer a value discount to all return customers in good standings. We loved our stay at this property. The pictures accurately depict the lovely, well equipped condo and the amazing view! It comfortably accommodated our family of four and the access to the beach was so convenient. Also, the owner was very prompt in responding to our questions. We loved it and would absolutely stay here again when we return to Maui!